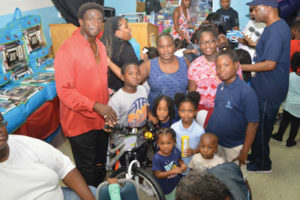 Gold Star Production, American Legion Deerfield Beach, Glenn Miller Post #287, and a group of volunteers collaboratively held their 15th annual Christmas Toy Giveaway on December 23, 2018.The celebration has become a tradition of sharing the Love of God by bringing smiles to the faces of children from all over Broward County. 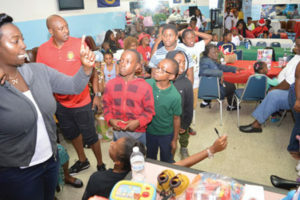 The American Legion displayed concern for helping the community by donating their time, space, and equipment, which aided in making the event a great success. Over 100 children arrived at the American Legion. The excited children were there to listen to a Christmas Good Citizenship Presentation, collect toys, enjoy a meal, and play games. The history of the Christmas event began 15 years ago by Mr. Colvin and Al Jones. They funded the event entirely with the assistance from friends. As the toy drive grew and gained recognition in the community, businesses, friends and community groups became partners. We humbly thank the following sponsors: Martin Chapman MMT Services, Ed’s Insurance, Isaac Rivers Rented4 Less, Henry L. Graham Liberian Development, Lynne Warrick Institute, Willie Henderson Berkshire Realty Weston & friends, Troy Lounge, Wallace Communications, Steven G. Interior, Cherry Blinds, IB Glazing, Pappa Johns, Pizza Hut, Winn Dixie and Rodney Baltimore HOT 105. Special thanks to GK Window Treatment Pompano Beach and staff for 10 years of support and Busy Bees Deerfield for past dedicated yearly support. Commissioner Gloria Battle and State Representative Gwen Clark-Reed were in attendance. Philanthropic donations and volunteers are welcomed to assist in our many community endeavors and start planning next year event. Deuteronomy 14-29 – Fatherless and Widows, within your town, should eat and be satisfied; that the Lord thy God may bless thee in all the works of thine hand which thou doest.